Yes I fell off the face of the earth for the last month. I'm not even going to start going into a discussion of what was going on, it will sound so contrived it would belong on a soap opera if it didn't really happen. So we'll focus on this being the first week of May. Which means, yes, Star Wars day on 5/4 (May the Fourth be with you). 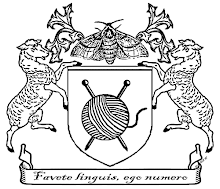 Also, incidentally, MARYLAND SHEEP AND WOOL! So yesterday and today I went up to help fold tee shirts. Those hundreds of tee shirts in a rainbow of about 15 different colors and 7 different adult sizes as well as children's? They don't arrive folded. They arrive boxed, ready to be folded. And so a variety of people showed up to unload all the merchandise and then spend two afternoons folding shirts. Again, not that there is any excitement building.